The great KATE CLINTON (out comic legend, star of stage, screen, blog and bookstore) headlines a very special night of phenomenal LGBT and LGBT-adjacent comics, including fabulous British stand-up star GINA YASHERE (finalist from NBC's "Last Comic Standing," "The Tonight Show" (as Madame Yashere - the Surly Psychic) and "Live at the Apollo") and brilliant boy wonder ADAM SANK (from NBC's "Last Comic Standing," Fox's "Laughs" and VH-1's "I Love the 2000s" and "Best Week Ever"). 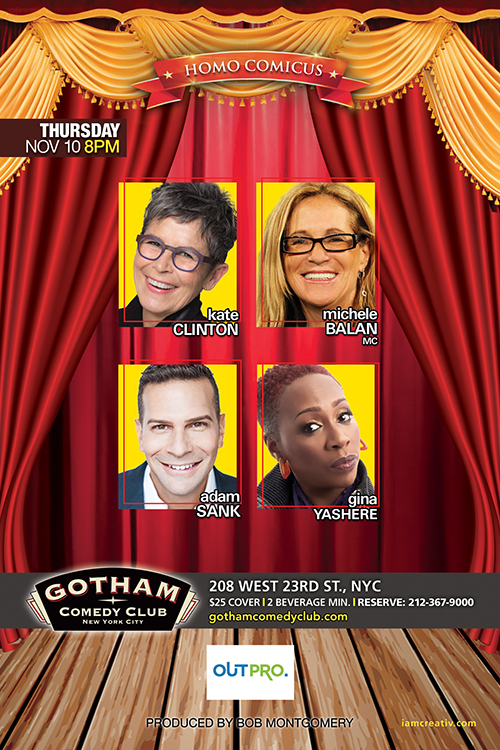 Hosted by High Priestess of Hilarity MICHELE BALAN (finalist from NBC's "Last Comic Standing" and so much more! ).